Miyamoto Musashi is arguably the greatest warrior to have ever lived. Known as “Japan’s Greatest Swordsman,” Musashi wrote The Book of Five Rings; a manuscript on philosophy, strategy, and tactics that is, to this day, studied by both warriors and non-warriors alike. In his book, Musashi repeatedly emphasizes the importance of the mind to win in any endeavor. In any battle, internal or external. The great swordsman was well ahead of his time in this respect, as were many other people of warriors as well as spiritual leaders. Fast-forward to present day, and this knowledge acquired long ago continues to be passed on. Even some within the scientific community – one known for its rigorous criteria – have reaffirmed the findings of ancient teachers. Neuroscientific research, for example, has conceded many of the Great Buddha’s meditative teachings; namely, his declaration’s on meditation and the mind (or brain). The point: the mind’s power is nearly limitless – a manifestation of the vast Universe. 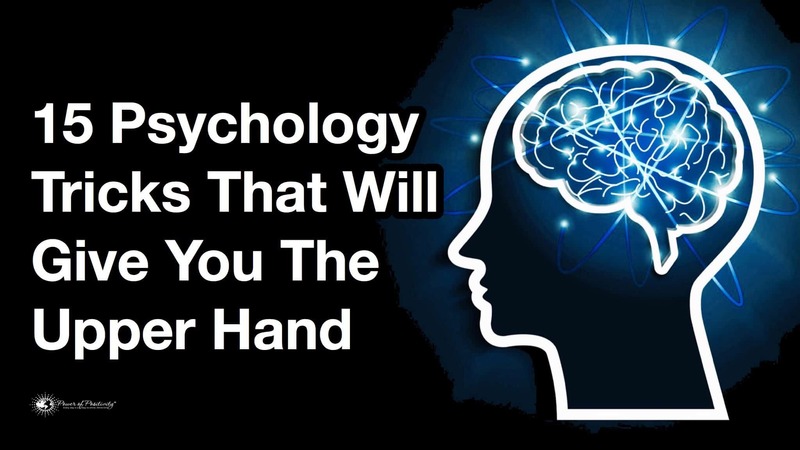 In this article, we discuss 15 mind “tricks,” that you can use to gain an advantage. Mr. Musashi would be proud. Terrible with names? Most of us are. Remembering a person’s name, especially in an office setting, can help make a great impression. Try your best to memorize the name after it’s said the first time. Repeat the name a few times, and make it a point to greet the person by first name the very next time you seem them. Most people are genuinely uncomfortable with silence. The next time you’re able to bargain or negotiate, make an offer and then stay quiet. This discomfort may be enough to tilt the odds of a good outcome in your favor. It’s said over and over that good eye contact is importance in forging strong connections. The problem is that not everyone is comfortable with initiating and maintaining eye contact for this reason. Instead, try to determine the person’s eye color or eye size. This may help sustain eye contact and reduce the sense of awkwardness. What do most people do who’re ready to end a meeting? They stand up and everyone follows, right? If you find yourself leading a group meeting, remain sitting until the very end. This will help ensure that people stay in place until you’re ready to finish. Mirroring body language has a distinct way of gaining someone else’s trust and respect. Clearly, this cannot be effective without subtlety. As such, mimic small movements to avoid instigating a sense of discomfort in the other person. Nobody likes a pompous jerk; but that doesn’t mean you don’t deserve to feel important occasionally, even if it’s just for yourself. Straighten up your back and keep your head upright. Others will notice, and so will you. When we smile, our brain instantaneously releases “feel-good” neurotransmitters. Endorphins are responsible for a wide range of emotions: confidence, joy, and optimism among them. Smiling may be all you need to have a better day. In a sequence of events, we’re more likely to remember the beginning and the end. Think of your favorite movie. Do the beginning and end stick out in your mind? Nodding when articulating a point of emphasis subconsciously evokes a sense of agreeableness in another person. As such, use nodding when trying to convince someone of your P.O.V. Ben Franklin once said: “He that has once done you’re a kindness will be more ready to do you another than he whom you yourself obliged.” In other words, asking favors creates more goodwill than fulfilling them. Fittingly, this phenomenon is referred to as the Ben Franklin effect. Maybe you want to assess the strength of alliances at your new workplace. Or maybe you just want to see who you like the best. When a group laughs together, look at the person in mind and pay attention to who they first look at. Often, this is the person with whom they’re closest. If you’re inclined to believe someone is waiting to confront you in a group setting, sit as close to them as possible. Physical closeness can defeat conflict, as the situation makes it more uncomfortable for the hostile person. Professor Colin Clifford, a psychologist at the University of Sydney, says: “It turns our we’re hardwired to believe others are staring at us.” To confirm this belief, we can check if someone mimics our actions. For example, quickly check your cell phone or watch, and then see what the other person does. If they do the same after you look at them, it may be an indication they’re watching you. This one’s kind of simple, but true nonetheless. A confident posture, as perceived by your brain, is one that takes up as much space as possible. Having an open chest and “long” arms and legs is one that assumes such a position. You’ll probably feel more some immediate self-assurance. Trying to obtain information from someone is not always an easy task. Once again, you’ll want to take advantage of silence and eye contact. Maintain this, and the person is likely to begin speaking again – and offering up some more info.